Our very first public coin auction will be held on Sunday April 2nd, 2017. Several hundred lots, more than $100,000 in Coins and Banknotes up for offer, including a diverse selection of our famous ‘Odd & Curious’ Medals, Tokens and assorted Collectibles. 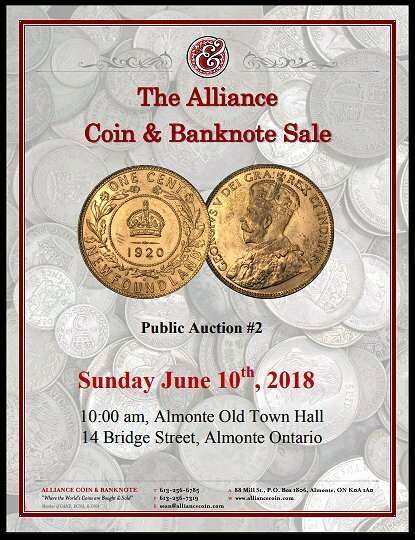 We anticipate having the full catalogue completed and posted to our website by mid-month, and invite everyone to join us on sale day at the Almonte Old Town Hall (just steps from our business), or for those unable to be here in person, to participate by submitting advance bids by either email, fax or telephone. For more details, and a selection of sneak preview items, please visit the Auction page on our website.